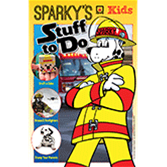 When it comes to teaching kids about fire safety, the Sparky® Stuff To Do Booklet has the right stuff! This action-packed activity book in a fun, new size keeps kids entertained while learning about fire safety. Sparky® Stuff To Do Booklet features 12 pages filled with an exciting mix of fun, educational exercises. Kids have a blast as they tackle puzzles, coloring, and other activities.